Ok, I'm pretty sure I just saw the coolest thing at CES. The eReaders, Smartbooks, eReader Netbooks, etc... are neat but I haven't seen anything I'd actually like to buy yet. Even Microsoft's Slate PC announcement was a disappointment. But this next thing is pretty sweet. 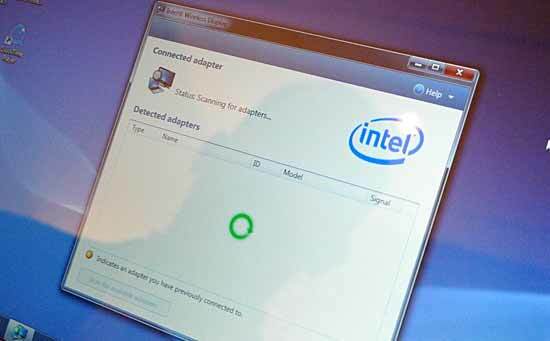 It's called Intel Wireless HD technology and it works like this. 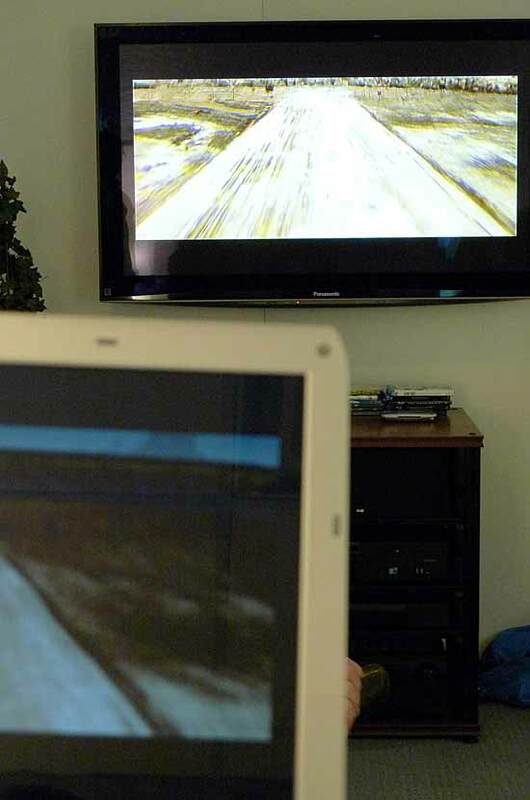 Press a button on your notebook and within a matter of seconds the notebook will wirelessly send its display over to your TV. 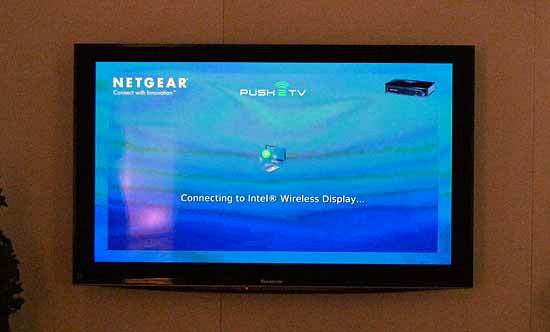 The communication happens via 802.11n and requires a receiving box hooked up to your TV. Your screen is sent compressed and up/downscaled to 720p, regardless of source resolution. The box is super tiny as it's basically a decoder chip and HDMI output. CPU utilization on a Core i5 540M is basically around 15 - 20% while you're streaming your desktop to a TV (all of the compression is done on the CPU). Streaming YouTube HD only took about 5Mbps of network bandwidth. It looked quite good and I didn't see any noticeable compression artifacts. 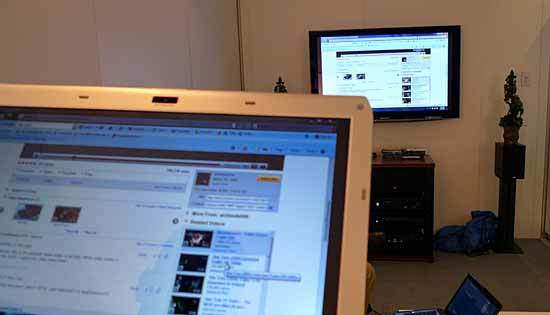 The latter may appear for higher bitrate content or on very large TVs, but for browsing the web, using applications, watching Hulu and most other video it more than works. Intel just killed the reason for most of the Boxee-like devices I've seen at CES. And it's only the beginning. Intel calls it a game changer. I call it the best thing I've seen at CES. It basically means that you can walk around with your notebook and put Hulu, YouTube, your desktop apps or games on your TV at the push of a button. Currently the wireless link doesn't support HDCP so it won't send Blu-ray video wirelessly, but everything else works. The first generation only supports a 720p output (your desktop res can be whatever, the software automatically compresses and scales the output on the fly). The next generation of the technology will support 1080p and eventually we'll have HDCP support as well. The receiver box is currently only made by Netgear and will ship bundled with three notebooks starting January 17th at Bestbuy. Additional Intel Wireless HD receivers will retail for $99. Intel showed us a demo on a Sony notebook but I believe Dell and Lenovo will also support the technology. The demo worked flawlessly when I saw it. I hate to keep saying this but it just worked. It's amazingly Apple-like to be honest. It's something I definitely want on my next notebook. I was standing next to Anand when Intel did the demo and it was pretty amazing that they were able to do the encoding and decoding using basic laptop graphics. VERY BASIC. 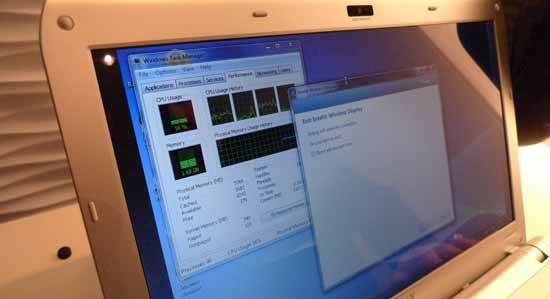 "CPU utilization on a Core i5 540M is basically around 15 - 20%"
If you are using a small laptop, you won't get much remaining performance. Does this require Intel software to be installed on the host PC? If so, will it run on OSX? 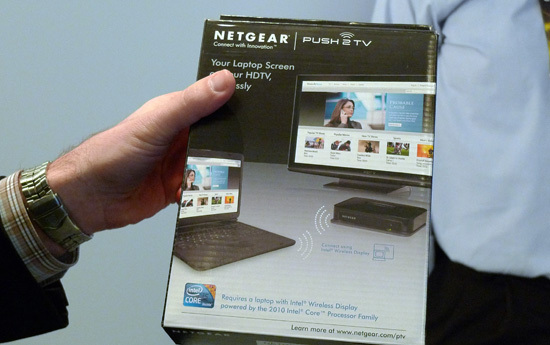 So you need A BOX connected to your TV (and to a power socket) AND a special notebook to view 720p non HD stuff with some lag, eating CPU power, but saving you from plugging HDMI cable into your notebook.